The High Line Park has become a magnet for visitors: New Yorkers not only like to stroll along this green park on stilts. The view upwards: surrounded by asphalt and concrete, the green park on the elevated railway line beckons. Parts of the original tracks have been purposely preserved, reminding people of the historic roots. The walkway made of long, pre-cast concrete planks is a design element connecting the planted area. The shape reflects the character of the tracks. The concrete strips that taper to one end, are like a comb drawn into the green area. 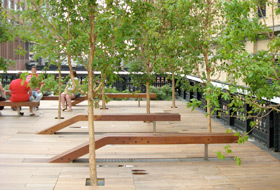 The benches look as if they are growing out of the ground and are a recurring design element. As a pedestrian and relaxation zone, the High Line has many special features: these wooden sun loungers on wheels can be moved around as required. The “Viewing Box” was developed to enable people to watch the traffic on the street below through a glass pane. The “suspended garden” is accessed through staircases and lifts. 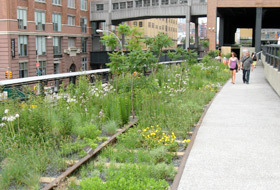 In June 2009, New York Central Park got a serious competitor: the High Line Park. Where freight trains used to roll, New Yorkers are now not only taking walks, but also sitting in the sun and enjoying the view of the Empire State Building, the Hudson River and the Statue of Liberty – and all this while suspended above the streets. 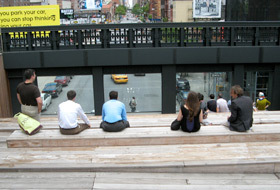 At the beginning of April 2010, the two millionth visitor was welcomed to the High Line. The New York High Line was built around 1930, which meant that freight trains no longer had to travel dangerously along the streets, but above them. The elevated railway line was built on stilts between blocks of houses and at a height of five to nine metres and a width of between nine and 18 metres. For 50 years freight trains travelled here along a stretch of almost 2.5 kilometres between today’s Javits Convention Center and Gansevoort Street. The railway line was shut down in 1980 and was largely forgotten about after that. A lot has changed since then: the grim industrial district in Chelsea has become an artist community with the greatest concentration of galleries in the world. And in the past few years, Stella McCartney has relocated her boutique to the Meatpacking District, as have many other stars and designers. And all the time, the elevated rail line on stilts has stood high above them, the vegetation unchecked and self-seeding for over 20 years, the seeds carried there by wind and birds. Then, all of a sudden, a group of private property owners with sites directly beneath the elevated rail line lobbied to have it demolished. “We can’t let that happen,” said Robert Hammond, one of the founders in 1999 of the community-based, not-for-profit organisation “Friends of the High Line”. He lives in Chelsea himself and wanted to preserve the High Line in his neighbourhood. 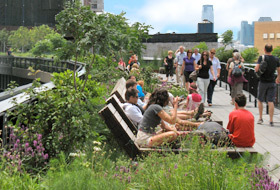 The Friends of the High Line now have over 10,000 supporters, among them many prominent figures. And they have managed to convince people. Back in 2001, the then Mayor of New York, Rudy Giuliani ordered the demolition of the High Line. Then in December 2002, his successor, Mayor Michael Bloomberg put a preservation order on it. There was no more talk of demolishing the High Line. On the contrary: Top architects and landscape architects tendered for the contract “The Suspended Garden”. The international ideas competition “Designing the High Line” was won in 2003 by a team made up of the landscape architects James Corner and his company, Field Operations, the architects Diller Scofidio+Renfro and the renowned plant designer Piet Oudolf, who had already planted the Millennium Park in Chicago, among other things. Their concept included ponds and benches, as with other parks. The Hudson River, the Empire State Building and the Statue of Liberty were to be visible from various viewing points. Access to the High Line was to be at regular intervals by means of staircases or lifts, as is the case with suburban train stations. The park was to be as wide as the tracks once were: so wide that two freight trains could pass by at a time. There were to be no kiosks or other commercial entities. The planners aimed to retain the character of the natural flora and wilderness that had been allowed to flourish there for 20 years. The tracks were also to remain visible, to remind people of their provenance. Field Operations developed the “planking” system, walkways made of concrete planks tapered to one end that allow the boundaries between hard and soft surfaces to become blurred. 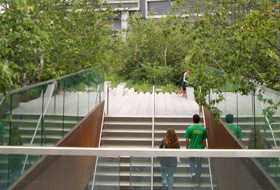 This homogenous walkway is a connecting element along the entire length of the High Line, guiding the park visitors at times along a narrow path, and at other times along a wider stretch through greenery. 210 plant species were selected, including many shrubs and trees that are thriving on a substrate with an average depth of about 45 cm. The design of the park allows for a great mix of micro-climates, from very wet, moor-like zones to vegetation with dry, steppe grass. Ornamental growth is not wanted here, (over)growing was purposely included in the plan. 2.5 m over the level of the former tracks, so that visitors can saunter along as if on a catwalk – beneath the leafy overhang created by the high trees. The benches “growing out of the ground” encourage visitors to pause for a moment during their stroll. Stopping a while is welcomed: here a sundeck with water features invites you to linger, over there you see rolling wooden sun loungers on the tracks and further down, a multi-level seating area. The “Viewing Box” resembles a theatre and was developed by the architects to enable people to watch the traffic on the street below through a glass pane. The concept has succeeded in combining city and nature in a most convincing way. Construction on section one, an approx. 800 m long section of the High Line, began in 2006. In June 2009 the Gansevoort Street to 20th Street section was opened. It includes 12 of the 22 blocks along the entire stretch. Meanwhile, the approx. 800 m long second section has now been completed. ZinCo Floradrain® elements are the chosen drainage element for “the longest green roof in the world”. These moulded drainage elements have storage cells on their upper side for storing precipitation. Excess water, on the other hand, is safely drained away through the channel system below. Floradrain® elements were installed across the entire surface, even beneath the existing supply lines for water and electricity. Concrete planks and substrate, naturally, require a real feat of strength on a building site. In comparison, the installation of the light-weight drainage elements seemed like child’s play. From a logistics point of view, it is vital that scheduling and adherence to deadlines are absolutely spot on, because street closures in densely populated cities are significant in their own right. The “Friends of the High Line” and the City of New York, under the leadership of Mayor Bloomberg, are working on securing the third and final section for public use. A positive decision by the New York City Council on 29 July 2010 has indicated that the final section can be purchased by the City, therefore, allowing the entire 2400 m to be developed into parkland. 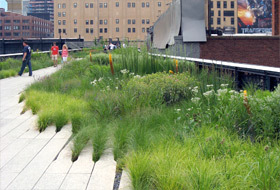 Although the High Line Park is only partly completed to date, the initiators of the Project have already won many prizes. 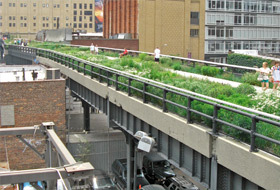 Among other things, the two founders of “Friends of the High Line”, the painter Robert Hammond and the writer Joshua David, received the Jane Jacobs medal in 2010 from the Rockefeller Foundation and the “Friends of the High Line” association was presented with the Doris C. Freedman Award by Mayor Bloomberg himself a month previously. 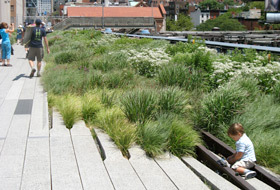 During the Greenroof Skyrise Conference in November 2010 in Singapore, “Friends of the High Line” were awarded the Green Roof Leadership Award 2010, which the IGRA (International Green Roof Association) awards each year for really exceptional green roof projects. Today, the association “Friends of the High Line” contributes about 90 % of the financial resources for the High Line project and is responsible for the administration and upkeep of the park and for organising the programme. About 170 million Dollars in total are slated for the entire project, provided partly by private investors and also from the New York public purse. However, experts estimate that revenue from the park will be about 5 times that! The “green belt” that is the High Line Park is attracting not only nature lovers, photographers, performance artists and music groups, but also investors to Manhatten’s south-west. For example, since the opening of the first section of the High Line, the Standard Hotel, designed by architects Polshek and Partners stretches over the High Line around 14th Street. And, on 23rd Street the 14-storey steel/glass tower “HL 23” designed by Neil Denarie, which also provides a spectacular view over the Park on Stilts, is now in the completion phase. The Whitney Museum of American Art is also building a new gallery, designed by Renzo Piano, that will be accessed from the southern end of the High Line. The green idea for the High Line Park has inspired similar projects around the globe. Urban planners from Rotterdam, Hong Kong, Singapore and Jerusalem have already viewed the park. There are plans to turn a disused railway track in Chicago into a green belt. In Philadelphia, there is talk of an 18 m high viaduct being converted and in Atlanta there are plans to create a green belt along a railway corridor (the BeltLine Project) – circling downtown Atlanta for about 35 km. 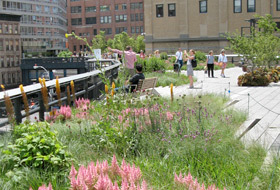 The popularity of the High Line Park along with the wave of imitations it has set off are a clear indication that people living in large cities are no longer prepared to drive long distances in order to enjoy nature. On the contrary, they want to be able to enjoy it right on their doorsteps. Yet another reason for continuing to look out for suitable areas on top of buildings to plant roof gardens with public access. An awful lot can be done with sophisticated roof greening technology.